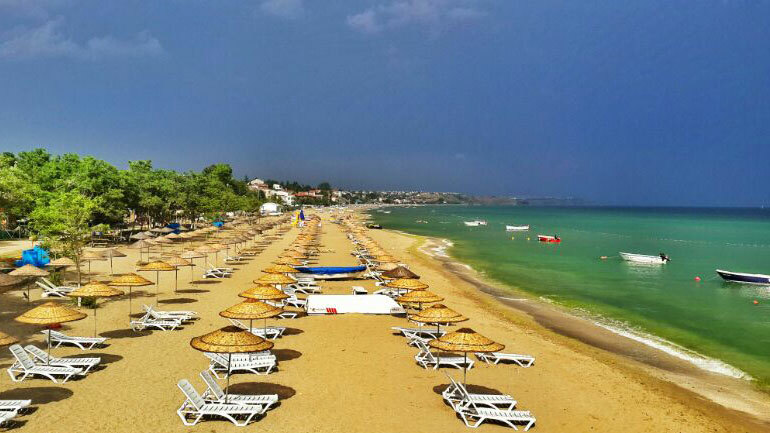 The perfect family seaside campground, SEMIZKUM MOCAMP ıs famous for its powdery white beachfront lyıng on the shores of the Marmara Sea. Enjoy the balmy weather as you sunbathe on a beach stretching over 250 meters. Swim and play with your children in the expanse of shallow, warm and crystal waters of our shoreline. Walk barefoot and let the fine sand massage and re-energize your soul. Hike or ride a bike and explore the surrounding trails and grounds. Try your luck, bring your rod and tackle and catch a fish or two. For the more intrepid and adventurous – scuba dive or snorkel and discover a new world under the sea. Or catch a favorable wind and surf your cares away. SEMIZ (ABUNDANT) KUM (SAND) MO(BILE) CAMP is the ideal vacation resort for people to relax and get away from the hustle and bustle of city life. A short drive from Istanbul, SEMIZKUM MOCAMP is one of the biggest camping grounds in Turkey, with a capacity of 300 caravans and tents. Reserve one of our campsites - drive in with your own caravan or pitch your tents. Or pack light and rent one of our many cottages, caravans or tents - we will provide pillows, blankets and bedsheets. Enjoy the cool, refreshing nights and dine al fresco - picnic tables and chairs are set up in front of our cottages, caravans and tents. We also offer electrical hook-ups to power up laptops, cell phones and other luxuries of modern life. And you can bring along your pet. Semizkum Mocamp lets you share your vacation with one of your best and most loyal friends! Come find out for yourself why so many people return again and again to SEMIZKUM MOCAMP. SEMIZKUM MOCAMP will capture your heart and give you unforgettable vacation memories you will cherish forever. Your Vacation Destination – Semizkum Mocamp!